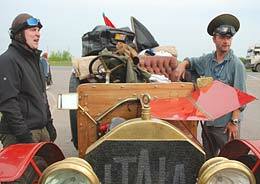 We welcomed back the crew of Car 2, the three-litre Itala of Jonathan Turner and Adam Hartley this morning…. readers with very long memories will recall they went missing soon after entering Mongolia. We left them behind at Ulaan Bataar to have a new crank-shaft made from solid lump of iron by optimistic craftsmen at Power Station Number Four. Today, the bright red Veteran was raring to go at the first Time Control of the day and the crew received a hearty welcome from rival competitors, including the crew of Itala Number One, David and Karen Ayre. Our photo shows the sort of celebratory antics that were going on early this morning with Jonathan sporting his newly acquired hat. Others were more interested in looking under the bonnet, and Adam finally felt obliged to undo the leather strap… There, for all to see, is a three litre engine, but, it never saw the inside of an Italian factory in 1907, although it does appear to be rather old. The downdraught carburettor looks like it would fit a Ford Capri. 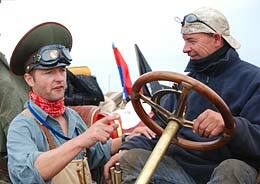 The engine, we are reliably informed, is out of a Volga truck and is two-and-a-half litres. Well, ten out of ten for initiative and refusing to call it quits, even if it has meant a very long truck journey – with the crew lapping up the luxury of the Trans Siberian Express while all the rest had to slum it the hard way. Not much else to report, it’s been a hot day, but a short one with less than 400 kms, but you need your wits about you for this trek, as the roads now we are nearing Moscow are considerably busier, and the number of trucks that we dodge in and out of is enough to keep anyone on their toes - apart from the ticking of the clock that comes from doing it all within a time-schedule. We came across the crew of car 34, the potent Alvis of Horst Friedrichs and Gerhard Lux who hold down 5th spot in the Vintageant Category, they were out of water, we offered them a bottle of lemonade as a donation for their radiator, but as they were parked by a small stream this was declined. We are now all parked up in the shadow of a giant statue of Lenin by the River Volga here in Novgorod. That is all except car 34, the Chevrolet of Daniel Rensing and New York Times correspondent Michele Shapiro, which had battery problems – the battery literally exploded yesterday, but being six-volt is not exactly a common thing to replace… and the crew of car 80, the Chevrolet of Russian-competitor Igor Kolodotschko, but if anyone can talk their way out of a problem he can. We understand he has suffered a terrible bout of blocked fuel lines, and a carburettor that refuses to perform even when it stripped and adjusted. The sweeper crews are out looking for Igor at the moment. The broken spring of Charles Stuart-Menteth yesterday meant missing a vital Passage Control and the final Time Control of the day, so has cost him a Gold Medal – a sad blow as the car was diligently prepared. The big Ford was up to 15th in the Vintageants Category at one point, but failed to re-start today. One who has caught up after taking a day out for repairs is the Porsche 356 of Gerald Harrison and Andrew Douglas. We also saw on the road today the Citroen of Alan Crisp and Chris Mower. Tomorrow being Sunday should mean a short run over considerably quieter roads into Moscow. At Moscow, Kim Bannister as Clerk of the Course will hand over his duties of manager of the sporting aspects of the event to Martin Clark, who takes over as Clerk of the Course for the second-half of the route from Moscow to Paris. Once out of Russia, a string of Time Trials kick-starts the competitive side - much will no doubt change in the remaining two weeks.